The word Tara is etymologically rooted in the word "star", but the most popular meaning of "Tara" is "she who saves," or "saviouress." As a popular Buddhist deity in the Mahayana tradition--especially in Tibet--Green Tara is compassionate, wise, and quick-acting. If one needs Tara and recites her mantra - Om Tare Tuttare Ture Soha - it is said that Tara will quickly come to assist. •Mythologically, the Green Tara came into being when the Bodhisattva Avalokitesvara cried upon seeing all of the suffering in the Universe. He cried so much that a pond grew out of his tears. Out of this pond grew a blue lotus flower, and on this flower appeared a beautiful woman. Her translucent green color was luminous with a great energy. She held a deep blue lotus, symbolizing limitless giving and refuge. The color green is said to symbolize her youthful quick action, and also her role as a forest deity. •Tara is believed to protect human beings while they are crossing the ocean of existence. Her compassion for living beings, her desire to save them from suffering, is said to be stronger than a mother's love for her children. Her most distinctive emblem is the blue lotus which she carries in her left hand. •Tara is usually depicted with her right leg extended, ready to spring into action, while her left leg is folded in the Buddhist contemplative position. The right leg symbolizes compassion and the left leg wisdom. These are the two virtues that, when developed together, lead one to enlightenment. Tara is often referred to as the Mother of all the Buddhas. She represents the motherly aspect of compassion. Tibetan Buddhism numbers 21 Taras representing different aspects or emanations of compassion. 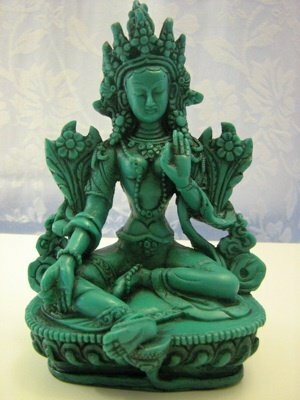 Beautifully detailed in a durable turquoise-green resin composite, the statue measures approx. 6" tall, 4" wide. Made in Nepal by a Fair Trade company.